Last night was the big reveal of our guild's No Prints Allowed quilt challenge. Back in December we were given charm packs of Robert Kaufman's Kona solids. The challenge was to make a quilt using at least a little bit of every color and not adding any print fabric. I had been thinking about making my own version of the Jane Stickle quilt for a while... I decided this challenge would be a good time to try some of the blocks. I made 16 blocks from the pattern book, all 9-patch variations. One of them had a little bit of hand sewing (top right block), all the rest were sewn by machine. I thought about hand quilting it at first; I have done that on a lot of the smaller quilts I've made, but in the end I decided that would be crazy and take too long this time. I had fun with the machine quilting and am really happy with how the quilt turned out! I strip pieced those tiny aqua 9-patches! I strip pieced several of the blocks actually. Anina's That Quilt blog is a great resource for the Jane Stickle quilt; she has posted directions for making each and every block on the blog and I am grateful for the time and effort she has put into it! Deb Rowden's report on our guild, I think it was her first time coming. Carla talks about her quilt and has pictures of several quilts from last night. Nikki's entry was an art bag to hold big art projects made by her kids. Jenifer's quilt "Don't Lead Where I Won't Follow"
The quilts were all so beautiful! Thanks again to Robert Kaufman for the gift of the charm packs! I love this quilt. 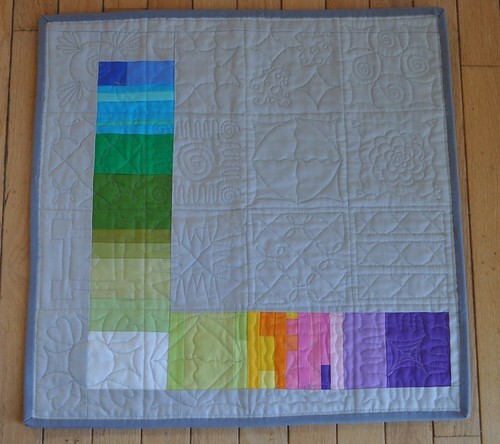 The quilting really stands out on the solids, doesn't it? Very, very nice! I just love it. I imagine it on a kitchen table as a runner.Very beatuiful work! As usual. Gorgeous Vicki, as always! Can't get over how tiny those little aqua pieces are, strip pieced or not. And your quilting is just perfect!!! I'm in awe! I'm not usually really fond of solids (other than as an accent or sashing or something). But this is wonderful. totally, completely bummed i missed the guild meeting again. as soon as this baby is healthy i am SO THERE. your quilt is fab, someday i'd like to see it in person. Your quilt is truly a work of art. I'm so glad I got to see it (and you!) in person. You took that challenge and knocked it out of the park Vicki! Stunning!!! I love seeing all the different quilting styles on the back. And those are some pretty teeny blocks . . . awesome! 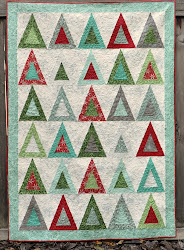 What a GREAT version of some dear Jane blocks - LOVE the use of the solids! This is lovely. A bit reminiscent of Hawaiian quilts. Wow! That is stunning! I can't believe it is made with all solids. It has so much details and I love how you changed the colors through the blocks! What a cute quilt! I love all the colors. You did a great job quilting it. My favorite is the flower in the center of the pink block, 2nd row, left side. Lovely quilt! You did such an amazing job. Your quilt is fantastic! I'm in the Triangle Modern Quilt Guild, and this is our challenge for our July meeting. Thanks for the inspiration, as I am having a really hard time committing to a design. That's the hardest part! This quilt is darling! 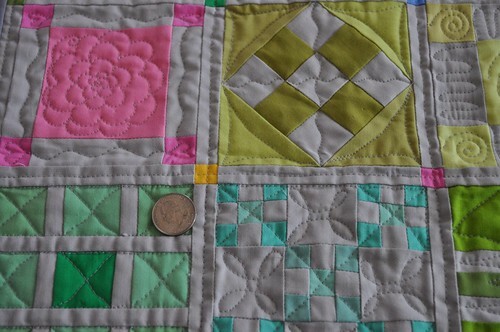 I love the different quilting in each block too! Good work! you've inspired me! 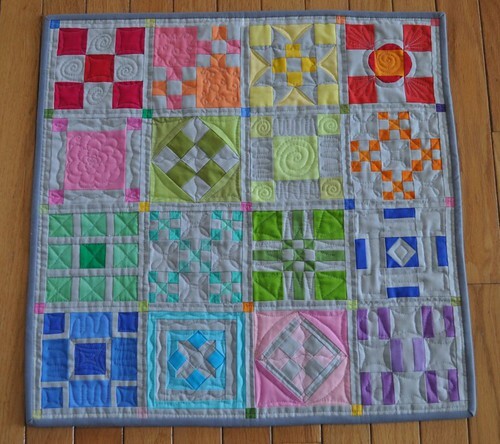 check it out :) http://thecutelifesmiles.blogspot.com did not know about the jane stickle quilt till i dug through your blog! 101 Patchwork Projects + Quilts! !